Jane Blundell Artist: Just 6 Colours - a lovely limited palette. 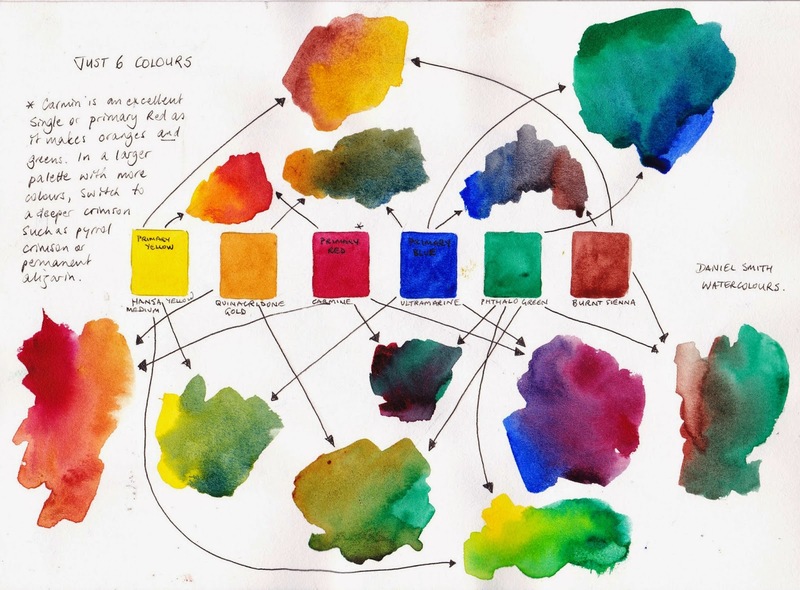 I recently put together a set of 6 colours to get someone started in watercolour. This page shows just some of the possible two colour mixes you can make with this set. Amazing mixes with just 6 colours. Add a third colour to each mix and increase the possibilities further. There are many possible 'just 6' combinations. I have chosen a mid yellow and a primary red that will each mix clean secondary colours, added a warm blue as this will make cleaner purples and more realistic greens. I have then added a phthalo green as this increases the green mixes but also makes black with crimson and turquoise with Ultramarine. Burnt Sienna makes wonderful dark browns, deep blues and greys with Ultramarine and deep earthy greens with phthalo green. The final colour could be an earth yellow such as yellow Ochre or raw sienna but I have chosen Quinacridone Gold as this warm and slightly neutral yellow makes wonderful realistic greens and will mix with Burnt sienna to make other yellow earths. There isn't much this palette can't do. These are all Daniel Smith colours but Da Vinci's Alizarin Crimson Quinacridone or W&N Permanent Alizarin or Carmin make alternative primary crimson reds; Ultramarine in most brands is an option, Phthalo Green BS is also available in most brands (called Winsor Green by W&N); Schmincke make a Pure Yellow that is a lovely primary yellow as is Winsor Yellow. Burnt Sienna is available in most brands but I prefer the versions made with PBr7. Quinacridone Gold genuine is only available from Daniel Smith but Yellow Ochre is an alternative, or use a Hansa Yellow Deep or New Gamboge. The next page shows my suggested next 6 colour additions to increase the colour range. These are Pyrrol crimson - a warm red, a Quinacridone Rose, an opaque Cerulean, a phthalo blue, a granulating earth yellow and a lovely deep raw Umber. With this set of 12 colours I would switch from Carmine to Pyrrol Crimson as the Quinacridone Rose covers the making purples role, or leave out Quinacridone Rose and keep Carmine. I would then add Indian Red, so I can use an earth triad, and then perhaps a lovely light Buff Titanium and a dark. Next are a whole lot of other wonderful Daniel Smith colours that are available to increase the palette. They are convenience mixtures to save time or special granulating colours that add and extra dimension to your work. I like to have some convenience colours so I don't spend all my time mixing while painting. Also I like to use only two or a maximum of three pigments in a mix if I can. Using a single pigment green, purple or orange can help with this. The mixtures are marked with an asterisk. All the others are single pigment colours. For more mixing charts see my website here. I really love your color studies. I'm learning so much from you. Hi Jane, I was wondering...is there a way to mix an approximation of buff titanium from the basic palette -- or maybe a slightly broader one? Or is it a color you really must break down and buy? I've been experimenting all weekend and never get it quite right. But maybe it's not possible? Oh thanks for this. You're making me feel much better. This mix is a lot like one I tried over the weekend (I had some Chinese white lying around) and it was always a little too blue, a little too yellow, a little too gray. Well, my birthday is coming up. Now I know what to ask for! LOVE your website. Such a great find. I will be back. Thank you again! Well happy birthday! Depending where you live you will fine it really useful. I don't know if DS is easy to find where you are but in Sydney Australia it is gradually being brought into stores. At a price! I paint a lot of Sydney sandstone and Buff Titanium, Goethite and Transparent Red Oxide are fabulous. TRO is a brighter and more granulating orange version of Burnt Sienna, made with PR 101. Not essential by any means but one of my favourite 'Extras', along with the expensive but amazing Green Apatite Genuine and the interesting three pigment mix Moonglow. I found my way to your site via Liz Steel who holds you in high esteem. I can't tell you how much I appreciate ALL the work studies you've done with watercolor paint. This is an amazing resource. Thanks so much for saving me scads of time picking out colors for a rather limited palette, which I've always enjoyed using, preferably no more than 12 colors. I live in the USA in the high desert which is made up of red and buff colored sandstone mountains and an alkali hard pan desert valley, once the bottom of a vast sea. Joan that sounds like a wonderful landscape to paint! It is fascinating how much each artists' limited palette varies. It depends so much on what you are painting. I try to come up with colours that will mix to paint any subject, but if you specialise in a particular subject you can be more specific in your colour choices. I imagine your palette would have some wonderful earth colours, especially granulating colours with few bright yellows or bright reds. Daniel Smith Piemontite, Hematite burnt scarlet, transparent Red Oxide, Buff Titanium, Lunar Red Rock, Lunar black and goethite are all fabulous colours for painting the desert, with great granulation. You can see some of these painted out above but rather small. I have also painted out some of them in my Blog looking at Burnt Sienna options - http://janeblundellart.blogspot.com.au/2013/11/watercolour-comparisons-4-burnt-sienna.html Others are in the tutorial section of my website. Others are still waiting to be added....so many paints! Thank you. This palette will really do a lot of you are not intending to get the 'exact' colour for all you paint. I love exploring limited palettes even if I don't choose to use one :-) Have a great trip. I have bought your ebook but my computer crashed and have a question - do you have instructions on how to paint your own watercolor mixing chart? Hope to retrieve my ebook from my harddrive! You should be able to reload the book if you go into your Blurb account. It can load back into iBooks on any Mac device. As for making your own charts - there are many ways! One of the most useful is to set them up in a good quality watercolour sketchbook or a loose-leaf folder system so you can refer to them. Set up one with green mixes, one with orange, one with purples and one with neutrals. Rule lines as a guide (I like to work 1.5cm high) and I use a 1/4" brush to paint the swatches showing a range of mixes from one colour through to the next. hi jane! I'm really curious about your choice of buff titanium - would you consider showing us the diff ways you use it/ the things you use it for? I know you mentioned its great for textures of sand/stone/buildings and such, but I'd love to see what it looks like! alternatively, which purple (in moonglow, shadow violet, and I guess piemonthe) is most diverse in its use in your opinion? thanks so much! In terms of purples, that really depends what you are after. Moonglow, being a 3-pigment mix, is interesting for its unique granulation - the crimson floats and the ultramarine and viridian settle and you can see all three in washes which looks great. It is a slightly neutalised purple though. 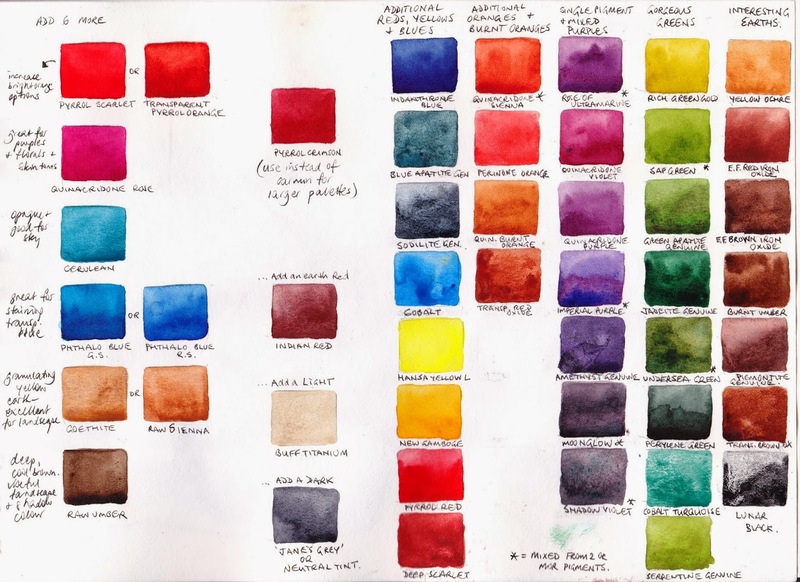 For the Pthalo Green here, are you recommending the yellow or blue shade for the limited palette? Thanks so much for your wonderful helpful blog! Phthalo green BS, as it will neutralise the carmine to create lovely dark greens, greys, plum colours, black etc. Have you got an update to a 6 colour palette or are you still happy with this one. Just saw this above, thank you Jane! I'm new to watercoloring and art in general. I found your blog and its great. I was debating on getting a cool and warm of red, yellow, and blue. However, after reading this article and seeing the color combinations as well as the colors I can add as I grow I have decided to try your six color palette. Thank you. They work very well! Quinacridone Rose (or permanent rose in some brands) is an alternative 'primary' red option rather than carmine, but I love the depth of the black and grey mixes you can created with carmine and phthalo green. what is the difference between carmine red and cadmium red? Could they be used interchangeably? I already own the wiinsor newton cadmium and I find a little goes a long ways. I try not to accumulate too many tubes of paint because it overwhelms me, and I work best using a limited palette.